Yoshie and I sent each other some stuff for Christmas, and I really love what she sent me. 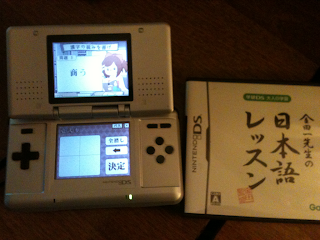 In addition to some snacks and a nice-fitting hoodie (which I'd like to talk about another time), she sent me a DS game called 学研DS大人の学習金田一先生の日本語レッスン (DS Study, Lessons for Adults: Kindaichi Sensei's Japanese Lessons). Although this is my first 学研DS game, I remember seeing them all the time in stores that carried DS software. They have quite a catalog of "games" (software might be a better term) that focus on language study or preparation for specific tests. There are a lot of these for foreign languages like English, Chinese, Korean, French, Spanish, etc., but I don't remember seeing many that focused on Japanese other than kanji study. This particular title seems to be a few years old, but it also looks to have some really cool features. 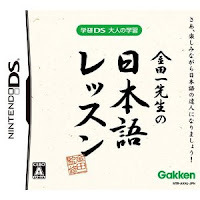 The two main gameplay modes are some kind of travel mode, where I suppose you make your way across Japan and play mini games, and free play mode, where you can try games you have unlocked in an a la carte sort of fashion. I've only played a few games so far and only was able to successfully answer one question. While I'm not claiming to be a Japanese master, I will tell you, this is a difficult game. I guess that makes sense as it is intended to refine a native Japanese adult's language ability. For a much more in-depth review, check out this old blog post I found at the ruins of an old J-blog.